The airline will fly the colorfully liveried Boeing 777-300ER between Taipei and Paris, starting Oct. 29, 2014. TAIPEI, Taiwan - EVA Air is taking its Hello Kitty Hand-in-Hand Jet to Europe. The airline will fly the colorfully liveried Boeing 777-300ER between Taipei and Paris, starting Oct. 29, 2014. EVA is offering the fun way to fly just in time for those who want to enjoy the splendor and romance of fall in the City of Lights. Travelers in both Asia and Europe can book flights now through travel agents, an EVA ticket office or on the airline�s website. EVA�s first long-range Hello Kitty Jet, the Hand-in-Hand Jet has proven to be popular among travelers worldwide since its launch on regular Taipei to Los Angeles service in September 2013. The airline has operated three Hello Kitty flights a week on the route for a little more than a year while fans in Europe have persistently asked for opportunities to experience the exclusive aircraft. This is also Hello Kitty's 40th birthday. Taking her to Paris and introducing her to more fans and passengers adds to the fun of the birthday festivities. 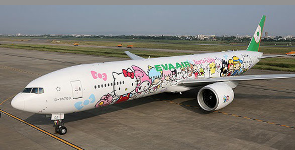 EVA also flies five Airbus 330 Hello Kitty Jets, each with a different livery theme, to multiple destinations within Asia. The colorful jets have proven to be very successful and demand for all of these flights from travelers and fans around the world is strong. The Hello Kitty Hand-in-Hand Jet is EVA�s first painted long-haul Boeing 777-300ER. EVA teamed up with Sanrio to create the livery and in-flight service items so that they reflect the spirit of the global village and friendship across all countries. The colorful display of major Sanrio characters, holding hands the entire length of the aircraft, is designed to bridge cultural barriers and invite new friendships around the world. EVA is using the charming, lovable characters to make flying fun and spread happiness among passengers all over the globe. EVA will operate its Hello Kitty Hand-in-Hand Jet on its regular schedule as BR87 from Taoyuan International Airport (TPE) to Paris� Charles de Gaulle (CDG) on Sunday, Wednesday and Friday. On the return, it will fly as BR88, CDG-TPE on Monday, Thursday and Saturday. EVA offers a total of four weekly flights between Taipei and Paris. Passengers can book flights now through travel agents, EVA ticket offices and online at www.evaair.com, just in time to enjoy picturesque Paris in fall or, eastbound, Asia�s diverse climates, cultures, foods and attractions. From North America, EVA offers 55 flights a week from Los Angeles, New York, San Francisco, Seattle, Toronto and Vancouver. The Star Alliance member links destinations worldwide, including cities throughout China and Asia. It offers more flights from North America to Taipei with more one-stop connections to more business and leisure gateways than any other airline. Travelers in North America can check schedules and book flights through travel agents, by calling an EVA reservations office and online at www.evaair.com. TAIPEI - EVA Air just joined officially on June 18 the Star Alliance network, further strengthening the Alliance's presence in Asia/Pacific. At the ceremony held at Taiwan Taoyuan International Airport Mark Schwab, CEO Star Alliance said: "EVA Air has successfully completed all joining requirements and I can confirm that our Chief Executive Board (CEB) has now unanimously accepted EVA Air into our Alliance." Founded just over 16 years ago, Star Alliance has progressively built its presence in Asia/Pacific and now has eight member carriers based in this region, which continues to show a growing demand in air travel, posting 5.2% growth in 2012. At present, 19 Star Alliance member airlines operate more than 4,000 daily flights to, from and within the Asia /Pacific region, serving 280 airports in 44 countries. "Star Alliance has since its inception had a strong presence in Asia / Pacific.With the addition of EVA Air to our existing combinations of member carriers and hubs, we further cement our position of providing the strongest network on an international scale to, from and within this ever growing region. We are looking forward to welcoming new customers from Taiwan and serving more travellers on the expanding Cross-Straits market", declared Mr. Schwab. Austin Cheng, President of EVA Air said: "Star Alliance membership gives us the privilege of serving new customers from all corners of the globe and introducing our passengers to the seamless services and status recognition that the Alliance provides. As a member, we have the opportunity to introduce travellers to new ways of connecting to destinations throughout Asia via our hub in Taipei." Ms. Wang Yingxiang, Vice Chairman of the Air China Group, a sponsor of Eva Air into Star, added that EVA Air integration will certainly enable the airline to further enhance its brand value, social influence and operations. EVA Air's customers will now have access to a global network of 28 airlines, operating more than 21,900 daily flights to 1,328 airports in 195 countries. 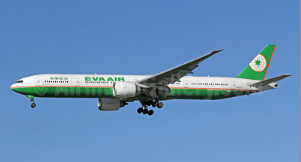 In addition to bringing Kaohsiung in Taiwan and Surabaya in Indonesia as unique airports to the network, EVA Air expands the Alliance's presence on the important Cross-Straits market, which has grown from an annual passenger volume of just over 3 million in 2009 to around 9 million in 2012. Moreover, Taiwan's geographic location is such that it has the shortest average distance to all major cities in the Asia-Pacific region, making Taiwan's Taoyuan International Airport an important hub in the region. to central and south-east Asia, Australia, Europe, Canada and the United States.